Outdoor kitchens are growing in popularity, even in our northern climates. Let Lakeside Fireplace help you customize and create an outdoor cooking oasis that fits your space and budget perfectly. Our staff is dedicated to keeping your grill and outdoor kitchen accessories functional and clean. No issue or question is too big or too small. Lakeside Fireplace offers grill cleaning, scheduled maintenance and repairs. 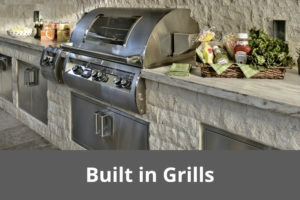 Please call or e-mail Service@LGLakesideFireplace.com to schedule a service appointment for your outdoor kitchen needs. 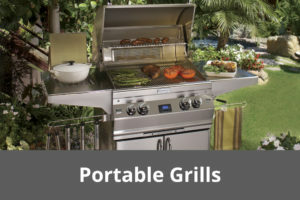 Life isn’t stationary and with our selection of portable grills, you can take grilling with you wherever life takes you. Lakeside Fireplace offers a wide variety of built in grill options ideal to fit any space and budget. 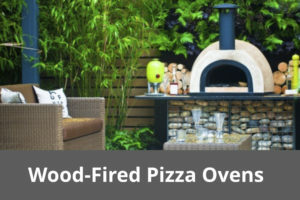 Anything you can cook in your home oven, you can cook in your outdoor wood-fired oven…great pizza is just the beginning! Bring that delicious smoky flavor to all your favorite foods and enjoy a timeless cooking style all year round. 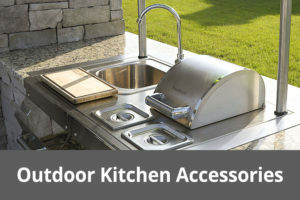 From tools, covers, drawers, sinks, stovetops, to refrigerators; Lakeside Fireplace has all the accessories needed to take your outdoor kitchen to the next level. A grill is more than just an elaborate cooking utensil; it can be the focal point for family gatherings, special occasions, and the enjoyment of an endless variety of grill-friendly foods. Your outdoor kitchen may be the social nexus that brings people together, or it may be simply the best way to serve a variety of foods with delectable grill flavor. If you see a better deal online with one of our competitors, let us know and we will match their price.